March 2011: Strongly reduced ozone values (left, dark blue) and significantly increased concentration of chlorine monoxide (right, red) that is directly involved in ozone degradation. About a year ago, IMK scientists, together with colleagues from Oxford, detected that ozone degradation above the Arctic for the first time reached an extent comparable to that of the ozone hole above the South Pole. Then, the KIT researchers studied the mechanisms behind. Their results have now been published in the journal “Geophysical Research Letters”. The team of IMK researchers analyzed measurements of the chemical composition of the atmosphere by the MIPAS satellite instrument developed by KIT. In addition, model calculations were made to determine concrete effects of further cooling of the ozone layer. “We found that further decrease in temperature by just 1°C would be sufficient to cause a nearly complete destruction of the Arctic ozone layer in certain areas,” says Dr. Björn-Martin Sinnhuber, main author of the study. Observations over the past thirty years indicate that the stratosphere in cold Arctic winters cooled down by about 1°C per decade on the average. According to Sinnhuber, further development of the ozone layer will consequently be influenced also by climate change. He points out that the increase in carbon dioxide and other greenhouse gases will warm up the bottom air layers near the ground due to the reflection of part of the thermal radiation by the bottom layer of the atmosphere towards the earth’s surface, but also result in a cooling of the air layers of the stratosphere above, where the ozone layer is located. After the first discovery of the Antarctic ozone hole in the mid-1980s, CFCs were rapidly identified to be the cause and their use was prohibited by the Montreal Protocol of 1987. However, it will take decades until these substances will have been removed completely from the atmosphere. 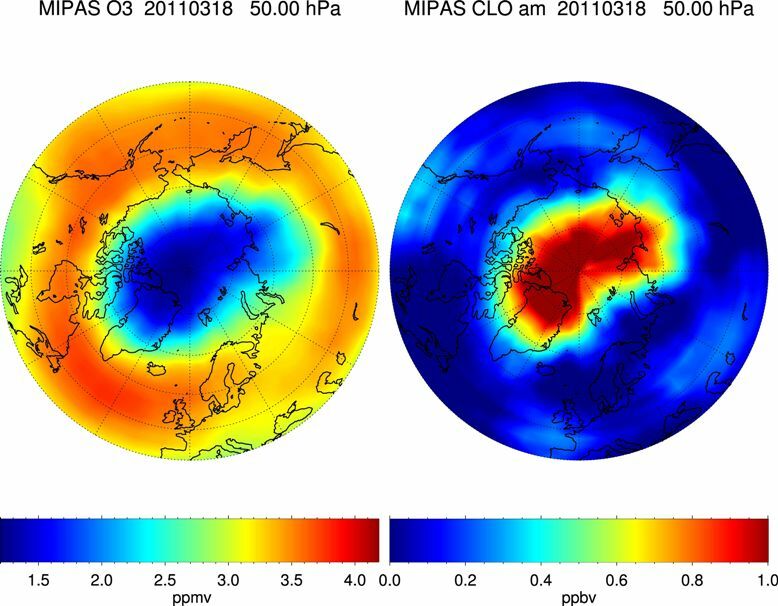 “Future cooling of the stratosphere would enhance and extend the impacts of these substances on the ozone layer,” says Dr. Björn-Martin Sinnhuber. It is now necessary to study potential feedbacks on climate change. More information: Geophysical Research Letters, volume 38, doi:10.1029/2011GL049784.